In her international bestseller Simple Abundance, Sarah Ban Breathnach inspired millions of women to find happiness in each day of their lives. 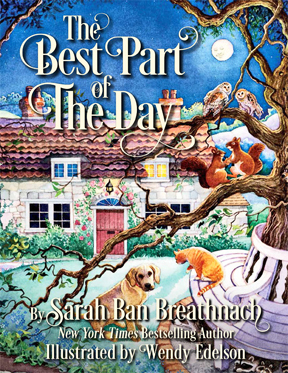 Now Breathnach is back with her first children’s book, The Best Part of the Day. Beautifully illustrated and lyrically written, this “good night” story encourages children to find at least one moment in each day that is worthy of celebration. The Best Part of the Day is the perfect addition to any family’s nighttime routine. < Entries (RSS) and Comments (RSS).